If your home has a hardwood floor made of fir, you may be considering getting it refinished. While it is important to always hire a professional for a high-quality refinishing job, there are a few things that you need to address in order to ensure a successful update. Fir hardwood flooring was a popular choice for a long time, but it has many differences from a traditional oak floor. It is softer, more susceptible to staining and may start gapping over time. A fir floor is particularly difficult to refinish on your own because there are unique qualities of the wood that may cause an inexperienced individual to damage a floor they are trying to fix. It is softer than other flooring with a score of 660 on the Janka Hardness Scale. In comparison, white oak ranks at over twice the hardness with a score of 1360. Therefore, great care must be taken to sand the floors since drum marks can easily be made if the sander is left in one spot for too long. The thinness of fir hardwood flooring is also considered when refinishing. 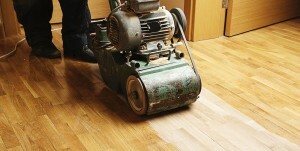 If your floor has been sanded in the past, there is a chance that it is so thin it may need to be replaced completely. This can be assessed by a floor supply company. Due to the nature of fir, mottling is a common occurrence of this type of wood. If there is heavy traffic in an area, you may begin to notice dark spots or bruises in these areas. This is because the cells and fibers are softer than other flooring that may get heavy traffic. These floors also have large gaps due to contracting and expanding over time. Solutions to close these up may include adding a fill putty. A professional can assess the damage and recommend refinishing or reinstallation of floor. Fir is a particularly difficult hardwood flooring to be refinished. It is not a do it yourself project and the best results will be achieved by calling a professional company.